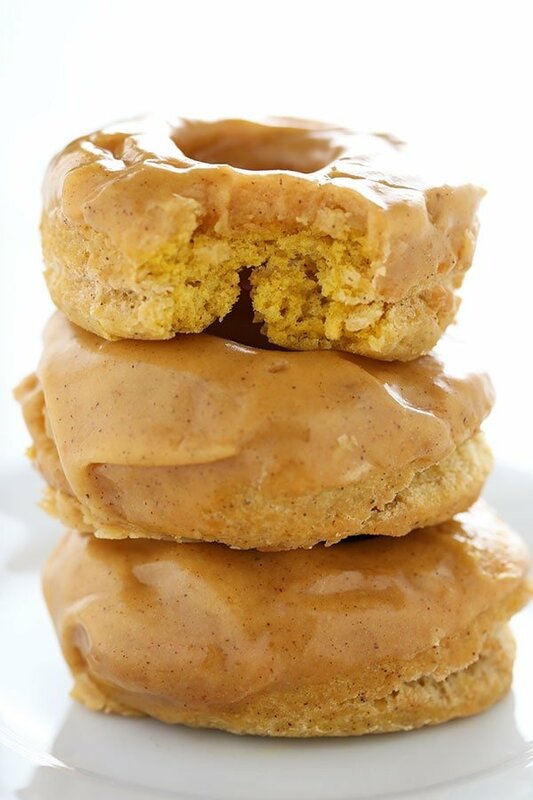 Pumpkin Old Fashioned Doughnuts are fried to perfection and loaded with pumpkin spice flavors and a thick shiny pumpkin glaze. No yeast required! Texture: The doughnut is crispy on the outside, soft and fluffy inside, with that thick shiny glaze on top. Mmmmm. Ease: I wouldn’t call this recipe easy, but it’s totally doable. Deep frying does make a mess and requires your full attention, but it’s so worth it. Cons: Baked doughnuts can be great, but the only way to achieve doughnut bliss to me is by deep frying. Which of course, is messy and indulgent. But for special occasions, it’s so worth it! Would I make this again? Yes yes and yes. Can you guess what my most popular posts in over 7 years of blogging has been? It has consistently been these Old Fashioned Sour Cream Doughnuts. Time and time again. You guys love those babies, and I totally understand why! I am obsessed with old fashioned doughnuts, the taste and texture is just unbelievable! So since we’re in the middle of the #HolidayBakingBonanza, I just had to share a version of that recipe utilizing pumpkin and spices! 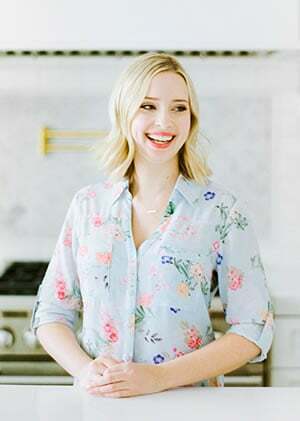 By the way, if you haven’t heard, I’m co-hosting the Holiday Baking Bonanza with Ashley from Baker by Nature to bring you the BEST holiday recipes, tips, tricks, resources, and giveaways throughout the season. To follow along, join our free Facebook community HERE. You won’t want to miss out! 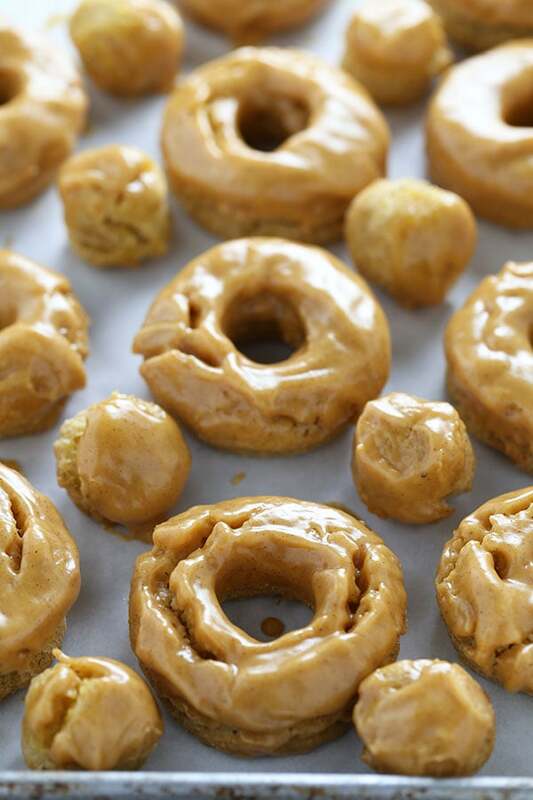 These doughnuts would be the perfect weekend baking project. You can even make and shape the dough the night before so everyone can wake up to freshly fried and glazed doughnuts. Mmm mmm. 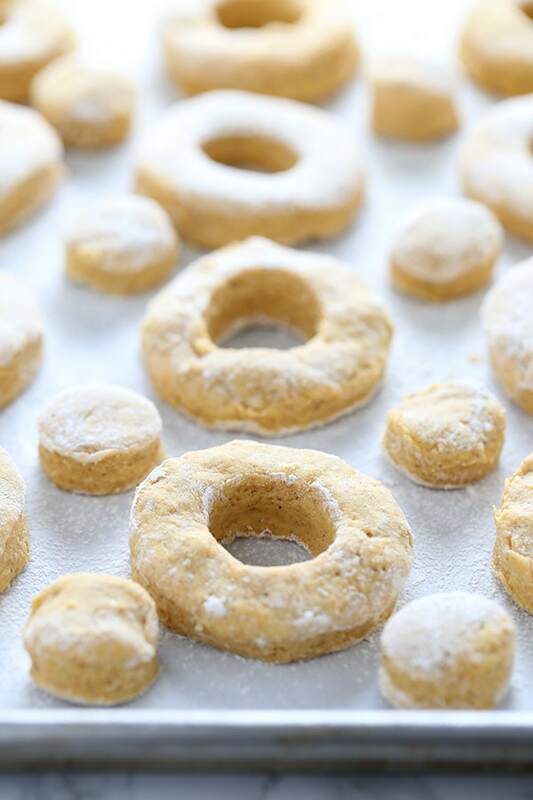 Yes, cake flour works best to create really light and tender doughnuts. Cake flour is actually made from a softer variety of wheat and is bleached and milled more finely than AP flour. It’s definitely worth the trip to the store to pick some up. If you really can’t get any, check out my FREE baking substitutions guide for a quick swap. Can I bake these instead of frying them? No. This recipe was formulated to be fried. That really does give you the best taste and texture. I have plenty of baked doughnut recipes here. Do I have to use corn syrup in the glaze? 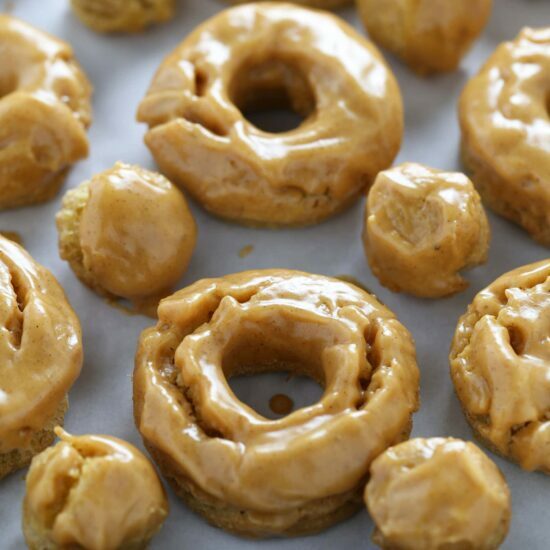 The corn syrup (or you can also use golden syrup) helps to create a glaze that dips beautifully and sets perfectly shiny just like the doughnuts from the bakery. You can leave it out if you must, but the glaze won’t quite be the same. The dough itself can be made, covered, and refrigerated up to 24 hours ahead of time. You can also cover and refrigerate the shaped uncooked doughnuts overnight. This is definitely the easier option for serving these doughnuts for breakfast, but the dough is also more likely to dry out slightly this way. Make sure it’s really well wrapped and limit the amount of time it’s sitting in the fridge. Once the doughnuts are fried and glazed, they need to be served that same day. In a medium bowl, sift together the flour, baking powder, salt, nutmeg, and pumpkin pie spice. In a large bowl, use an electric mixer to beat the sugar and butter on low speed until sandy, about 1 minute. Add the egg yolks, increase the speed to medium, and beat until light and thick, about 1 minute. On low speed, gradually add the flour mixture to the bowl in three additions, alternating with the sour cream and pumpkin, mixing until combined. The dough should be sticky like biscuit dough. Transfer the dough to a clean bowl and cover with plastic wrap. Refrigerate for 45 minutes, or up to 24 hours. In a large bowl, use an electric mixer to beat the powdered sugar, corn syrup, salt, pumpkin pie spice, pumpkin puree, and vanilla until combined. On medium speed, add gradually add the water, scraping down the bowl, until incorporated. Set aside. When ready to fry, pour 2 inches of oil into a large heavy pot. Attach a candy thermometer and heat oil to 325°F. On a generously floured work surface, roll out the cold dough to 1/2-inch thick 8-inch wide round. Cut as many doughnuts and holes as possible, dipping the cutter into flour to prevent sticking. Fold and gently re-roll the scraps to make extra holes. Shake any excess flour off the doughnut dough before adding them to the hot oil about three at a time. Wait for the doughnuts to float, then fry for 20 to 30 seconds. Gently flip over and continue frying for about another minute, or until golden. Transfer to a paper towel lined cooling rack to drain. Fry the holes for about 20 to 30 seconds per side. While the doughnuts are still hot, give the glaze a whisk before dipping the cracked side of each doughnut into the glaze. Let dry on the cooling racks until set, about 15 minutes, before serving. Glazed doughnuts should be served the same day. I bought a bag of Pastry Flour a while back. How is that different than cake flour? Hi! I was wondering if your old fashioned sour cream dough can also be refrigerated for 24 hours as well. 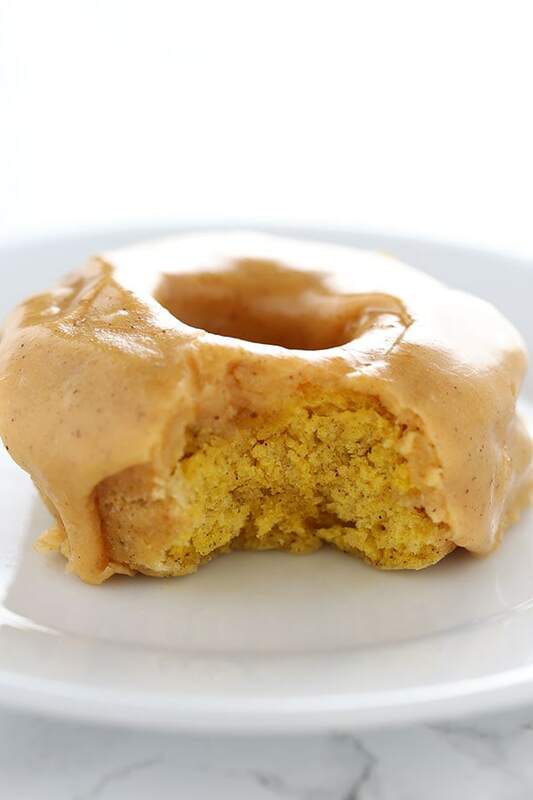 My mom, unfortunately, is not a huge pumpkin fan but I’d love to make the sour cream version of this doughnut. I made these tonight. Followed the recipe exactly to the letter. The dough wouldn’t even come together because it was so dry even had about a 1/4 c of the ingredients left in the bottom of the mixer bowl and would NOT incorporate. Finally had to add about a tbsp of milk just to kinda bring it together. The dough was so tough you couldn’t chew it. They didn’t split. Not sure what went wrong. HOWEVER the flavor was amazing enough that I will try again if I can figure out what went wrong. Hi Angela, I’m sorry to hear that! Did you use cake flour, and did you measure it by volume with measuring cups or by weight?